melz world: Happy Birthday, Peasnap! Anna Marie is 5 today! This is the picture we used on her birth announcements. 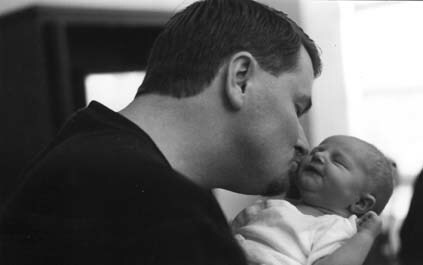 Many people said they thought it was a "stock photo" until they realized that was Jason kissing that baby. Of course, it was taken by Amanda. She's been The Official Anna Marie Personal Paparazzo right from the beginning. I have NO IDEA where the last five years have gone. And it's funny - I can look at this picture, and I still know it's Anna Marie. She looks the same, except bigger and with more hair and attitude. She had a ROCKIN party yesterday. That post will come later, and probably at her blog. It's the first time we've had her party at our house, and I realized something - when everyone is gone, you have to clean up! Who came up with this arrangement, anyway? Very unfair. At least she got lots of loot for our trouble. Including the soccer goal (Aunt Manda bought it) and a size 3 ball (from Aunt Naw) and, from my dad, a Lightning McQueen radio controlled car. And yes, that title says "Peasnap." When she was born, they wrapped her up and only her tiny little head was showing. Mom said she looked like a pea in a pod, thus the name "Peasnap." That's our little pet name for her now. I'm taking off work after lunch (have to cover a County Supervisors meeting this morning) and we're going on a picnic. To Conger Park, her favorite park in the whole wide world. I'm so glad it's a pretty day! Thanks! She really thought that 5 was going to be a "magical age" but she admitted tonight that 5 didn't feel much different than 4. The only bad thing is her decision not to call me "mama" anymore but "mom." It sounds so teenager-ish coming from her!